Here we go again. I was hurting for stories but my pleas on the Redtag Net brought some results. It was more than I needed so I had to edit the inputs. Got an email from Grant Lannon. "We are having another successful year with the Commemorative Air Force. Our WWII hangar in San Marcos remains the center of activity for our 10 vintage aircraft. I am still flying the B-25 and my half of a T-6. We have four ship formation flights for veteran events and special days and are training civilian pilots in formation flying. 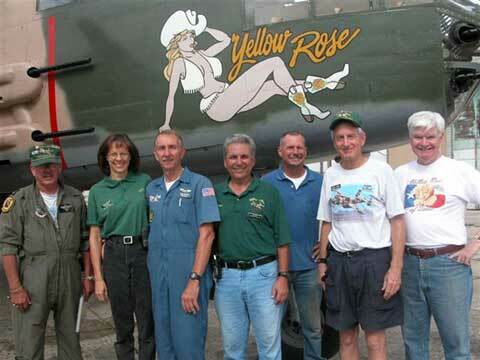 The Yellow Rose, our B-25, is on another hectic air-show season. Enclosed is a picture of a crew going to the Oklahoma City air-show. I am the second from the right with the bony knees. I also flew another B-25 in a four-ship that included two B-25s and two T-6s over USAA headquarters during their Springfest. I was able to spend a few minutes with Butch Viccellio in his office but he had a heavy schedule that day and we could barely catch up on each other’s activities. I recently got my FAA CFI credentials and when a friend had a heart attack and temporarily lost his medical, I took over his pre-solo students and soloed 5 of them. That took me back 40 years to my days as a UPT instructor. Flying vintage aircraft is the only way to go. I am not sure it would be as fascinating otherwise." Thanks for the information, Grant. Great picture, even with your bony legs. They don’t turn me on but I’m sure there’s someone out there who will appreciate them. Keep flying those grand planes. Also got an update from Bob Davey; Harry Paddon forwarded your e-mail asking for some material for your Checkpoints column. Julie and I retired a year ago, Julie from teaching journalism and writing at Fullerton College and I from teaching aerospace engineering at Cal Poly Pomona. We both continue doing volunteer work. But most of our time has been spent traveling and overhauling our house. 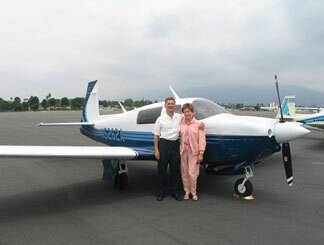 Our preferred transportation device is a Mooney 201, shown in the attached photo. We've had it since 1988 and recently completed a major upgrading. It's a pleasure to fly, even on long trips. We've taken it across the country many times and up to Alaska once. We fly weekly "hundred-dollar-hamburger" flights around the Los Angeles area. Hope all is well down in Florida. Regards, Bob Davey." Thanks, Bob, for that great update. My uncle used to be a distributor for Mooney aircraft back in the 50’s and 60’s. Great planes. Tell Julie that my wife continues her quest to be a writer. Got an email from Gary Forrest. "Hi Jack: That opening in no way refers to illegal activities on board airplanes but is intended as a social greeting to an 'old' friend". My main intent with this note is to respond to your query in Checkpoints. I don't think I was the first All American at the Academy. Something sticks in my mind about Brock Strom receiving that honor...but, as with most other things at this age...the memory isn't what it once was. I can't even look in the old yearbooks or Checkpoints since all my copies were destroyed years ago. The good part is that now I can embellish any story I want and no one knows the difference. We live a couple of hours from you in an old folks home in the center of the state (The Villages). When in the neighborhood give a call. Always glad to host old friends, even young ones for that matter. Regards, Gary. Thanks for the updates. You know it’s time for us Redtags in Central Florida to get together this year for a weekend. Let me know. Got this from Tom Rausch. Just thought it may be of interest that another RedTag lost a battle with the tax authorities. I have been contesting my categorization as "ordinarily Resident" in Germany per the NATO SOFA. Being ordinarily resident means you have to pay German taxes. (In addition to US taxes of course.) After 3.5 years, the case finally was heard before the Tax court. Not only did they rule against me but they abrogated the German American supplementary Agreement to the NATO SOFA. Another guy who was also fighting the German taxes and went to court the same day, also lost. A few weeks ago, the Finanzamt people showed up at his door unannounced to inventory his property and confiscate all his financial records. It is going to be very difficult for US contractors working for Uncle Sam here in Germany in the future. Other than being a few dollars poorer, Renate and I are doing fine. The door is always open for any RedTag who takes a hop through Ramstein. Regards, Tom." Sounds like you got the old gestooten shaften from the good old boys. They probably take lessons from Reno politicians. Heard from Al Sigman. "I am still selling real estate with RE/MAX Masters in the Denver Area and as of June 1, I am the Director of Real Estate for the Lowry Redevelopment Authority. I got a call from Tom Markham (a young Redtag-'66) the LRA Director, asking me if I was interested in a "part time" position to finish marketing the remaining sites on Lowry. I am really enjoying the opportunity and like all RTB'S, have some fond, and some not so fond memories of our time there in 1958. I invite any RTB's in, or passing through the area to give me a call and I would be happy to take them on a tour. I can usually be reached at 303-550-7646. On the family side, Gerri and I have two children and five grandchildren. All are doing well. We see a few RTB's once in a while, primarily at AFA football games. Best Wishes to all. Al Sigman" If I’m in Denver, I’ll drop in on you. I’d be interested in seeing Lowry again. A note came in from Mitch Eckel. First, our oldest son, Mike, has gotten his dream job as a foreign correspondent for the Associated Press in Moscow Naturally Susan is already planning a trip to Moscow to see him. No spouses yet for him or my other two sons. They all live with significant others but no one seems to get married. We will probably be dead before there are any grandchildren. Second, my little law office is now up to five attorneys - me and four women, three of whom are mothers working part time. Someone has said our tradename ought to be "Mitch and the Four Chicks". The goal is to get these women so profitable that I can cut back and work less. Nice group of people and we have a good time. It's real interesting being a fly on the wall and observing the female humor. Fortunately, these are real bright, hardworking women, and I sort of preside and let them do their own things. 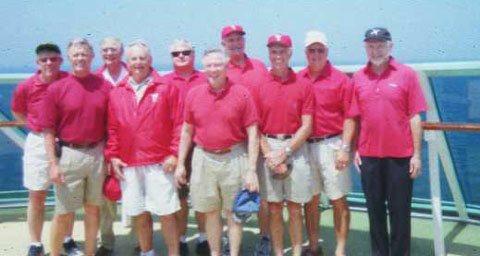 Third, we also went on the Red Tag Cruise out of Galveston in April which Penny and Jim Mack organized. We tooted around the western Caribbean for a week with nine other Red Tags and had a good time. Thanks Mitch for the update and I did get the picture. Left to right: Jim Mack, Bob McNaughton, Don Shepperd, Jon Staples, Larry Gooch, Mitch Eckel, Hal Rhodes, Dan Pemberton, Huck Spory, and Rudy Bow. Also got some medical news from Randy Schamberger: "Sorry to report that my tennis playing has been curtailed for a while. The first part of MayI was helping my neighbor install a new washer and dryer set (stackable). As we were lifting the dryer to place it on the washer, I felt my left biceps "pop" and go numb. My biceps had disappeared on the inside of my arm. I had detached the distal biceps tendon from my radius bone. I underwent surgery on 12 May to reattach the tendon and have been living with an adjustable brace on my arm ever since. I get to take the brace off tomorrow, 21 June, and then undergo some physical therapy. My left arm is shriveled up like an old man! I found an article on the Internet that said men over 40 shouldn't attempt to life heavy objects like refrigerators, washers, dryers, etc. Turns out my orthopedic surgeon was Ted Macey, '74. Also turns out he was one of my Mech students when I was teaching at the Academy! Small world. Thank goodness, he was a good student and had no "scores" to settle! OK, that's my news for now. Hope it helps fill your slot. Randy"
Thanks for the inputs. Last minute stories helped fill the column. That’s it.